At 2014 Paris Motor Show Volkswagen showcased its all new XL Sport Concept 2014. As the name suggests this concept looks like XL1 wearing sportier attire and being loyal lot many features in the interior and exterior resembles to XL1. But logically and changing the camera’s angle, XL Sport Concept 2014 is a lightweight race inspired body model celebrating Volkswagen’s 200 million vehicles assembly. Let us know more about this sporty concept. The interior of Volkswagen XL Sport Concept 2014 is designed keeping the XL1 interior as base. Featuring sporty dynamics in this queue first stands the all new digital instrument cluster featuring individual lap time and oil-pressure display. Same instrument cluster borrows another instinct with a carbon part to eliminate reflections. More in the same context bringing sporty look in the interior of XL Sport Concept 2014 are the round air vents, aluminum prepared shift paddles and the black base getting contrast of red stitching all around the cabin. 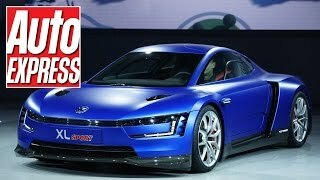 In terms of exterior of Volkswagen XL Sport Concept 2014, things are a step ahead when compared to predecessor. Large bumper air dam, a vented hood and couple of side vents over the flat nosed front fascia of XL Sport Concept makes the front look aggressive and sporty. Moving towards the rear fascia more changes comes into notice through carbon fiber diffuser featuring four fins and two exhaust tips located on sides top the notch with the commendable contribution to the sporty arena. Rear fascia in fact is an example of pure world class engineering designed to rule through its adjustable wing and all new hood. While the side skirts come with a three color tone the 18” forged magnesium wheels also add to the glory being wrapped in high-performance tires. In all the exterior of Volkswagen XL Sport Concept 2014 very well goes with the sporty interior and keeps the company’s intention to make a sporty and aggressive vehicle in priority. 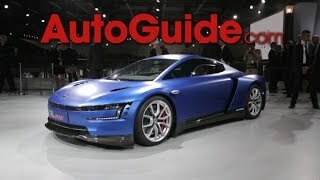 Volkswagen XL Sport Concept 2014 gets its power through a 1.2 Liter V2 engine delivering 197 hp and 133 nm torque paired to a seven-speed DSG transmission. 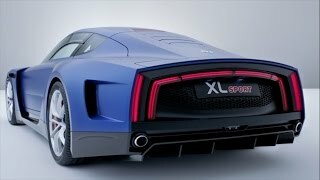 Engine with its power and the lightweight body of XL Sport Concept 2014 takes the car to a top speed of 167.7 mph with 0-62 mph sprint covered in 5.7 seconds.